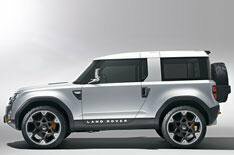 Land Rover Defender concept revealed | What Car? Land Rover will unveil this Defender concept car at the Frankfurt motor show. The company confirmed that a production model will be launched in 2015, but stressed that the Frankfurt concept car is at the start of the design process and is not the finished article. Land Rover says it wants to 'engage with existing and potential customers to help us finalise the details of the new vehicle'. The concept car is called DC100 and in keeping with the no-nonsense nature of the current car, D stands for Defender, C stands for Concept and 100 refers to the car's wheelbase. The current Defender comes in wheelbase sizes - 90, 110 or 130. Further details about the car will be announced at the Frankfurt motor show on September 13.